I’ve just come away from a week in the new-for-2016 Scion iA. It’s going to change the way a lot of people look at subcompact cars. That’s a good thing — unless you’re a competing subcompact car. The first thing everyone should understand about the 2016 Scion iA is it comes in only one flavor. There are no trim levels to choose from, no factory wheel or infotainment packages to add cost. The only option with which prospective Scion iA buyers are faced: whether to shift for themselves. The automatic transmission in my test car cost an extra $1,100. A six-speed manual transmission is standard at an MSRP of $15,700, while my tester rang the bell at $17,595 after destination fee. 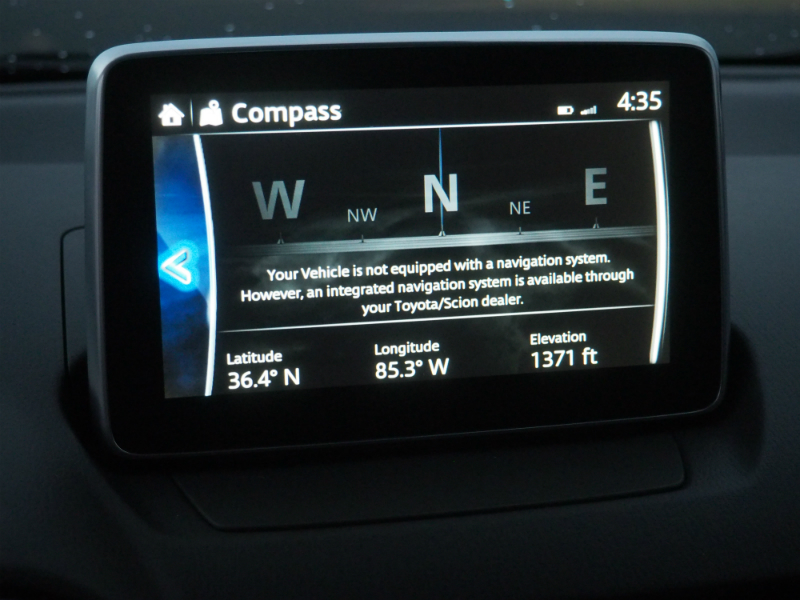 To be fair, there is at least one other option — navigation — but it’s a so-called “dealer-installed” item. And by “dealer-installed,” I mean your Scion dealer sells you the SD card containing the navigation system’s map data for an additional $419. My tester didn’t have the SD card, by the way, so I was unable to test the navigation system. The on-board electronics were certainly not Scion’s regular Pioneer/Toyota Entune-tinged variety — but they were quite good. I’m probably far from the first person to tell you Mazda builds this car for Scion. It’s a rebadge of the Mazda2 we aren’t getting in the U.S. anymore (at least for now.) 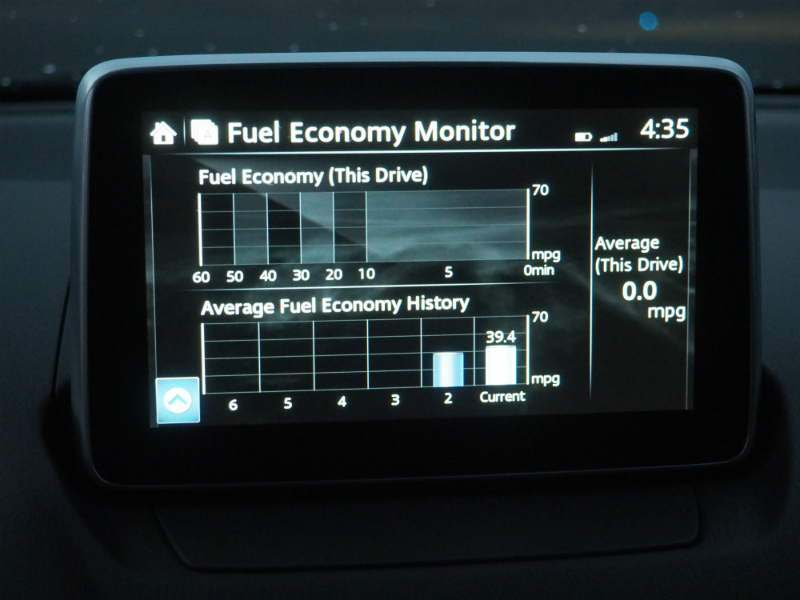 That being the case, I have to say I prefer Mazda’s infotainment screen and controls more than Toyota’s. Some deride the touchscreen sticking up out of the dash, but I think it looked elegant. Others aren’t fans of the console-mounted device used to control the infotainment system if you don’t like using that touchscreen, but I liked the multifunction dial a lot. It made controlling the system while keeping my eyes on the road a relative breeze once I got used to how the dial worked and how the on-screen menus were laid out. From an electronics-ergonomics perspective, Toyota/Scion/Lexus could learn a few things from Mazda here. 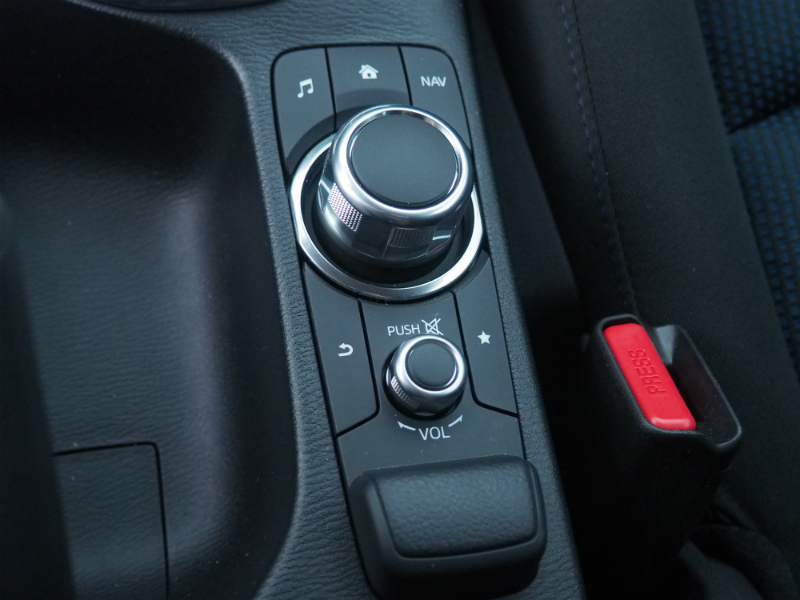 But the electronics, while good, aren’t the important thing about the Scion iA. 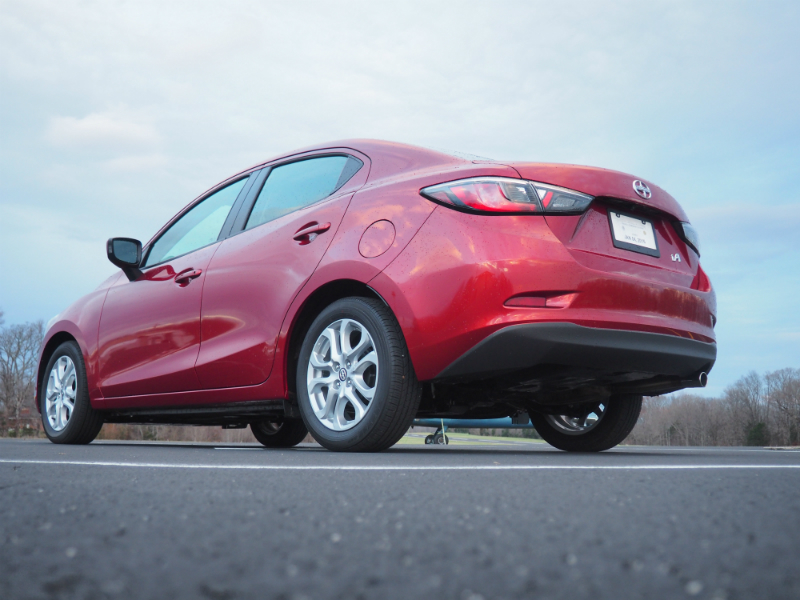 The reason it resets the narrative for subcompact cars is its sweet driving demeanor. It’s not bursting with power by any means — just 106 horsepower and 103 lb-ft of torque — but it’s got a super-light 2,416-lb curb weight with the tested automatic transmission. That automatic is a six-speed unit that does a good job summoning those relative few horses whenever the BMWesque floor-hinged throttle pedal is mashed hard enough. The suspension is pretty standard, with MacPherson struts up front and a torsion beam out back, but the tuning strikes a beautiful balance between responsive handling and a ride that won’t jar the fillings out of your teeth like many sporty-handling cars. A friend and fellow auto reviewer recently opined that the iA harkens back to the golden era of Japanese subcompact sedans of the mid-’90s with its balance of fun-to-drive characteristics and frugality. I also found the iA hit that sweet spot, being a lot more fun to drive than its modest power would suggest while returning an honest 40 MPG — and that’s despite my hooning the car quite a bit on backroads. The competition had better be taking notes. For starters, I’ve driven the Nissan Versa Note three times, and I can tell you nobody’s buying it for its driving dynamics. It’s huge inside, gets good gas mileage, and it’s cheap to buy. That’s what it’s got going for it. But it’s nowhere near as pleasing to drive as the iA. While I haven’t been able to drive many other subcompacts — automakers don’t send out a lot of their cheapest cars to be reviewed, I suppose — I can’t imagine the Hyundai Accent or its corporate cousin, the Kia Rio driving this well based on reviews I’ve seen. The Chevy Sonic is aging and probably wouldn’t drive this well outside of its sporty RS trim, which brings with it a more complex turbocharged engine. The Honda Fit has the interior size advantage and handles with a more sporting demeanor than the Versa Note, if reviews are to be believed, but I doubt it would offer this much fun at this price. The model clearly in Scion’s crosshairs, I imagine, is the Ford Fiesta. By most accounts, the Fiesta drives very well. Having sat in several Fiestas, I can say with some authority that the Scion iA has it beat when it comes to interior packaging. 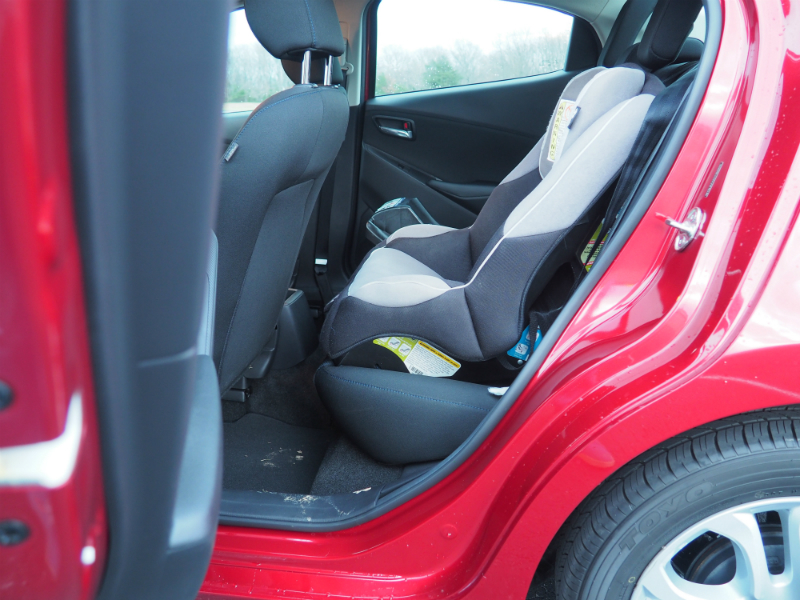 While the space inside the iA is not really any more accommodating than the Fiesta for this tall driver with two child seats in the back row, the outward visibility and the center stack are way more user-friendly. 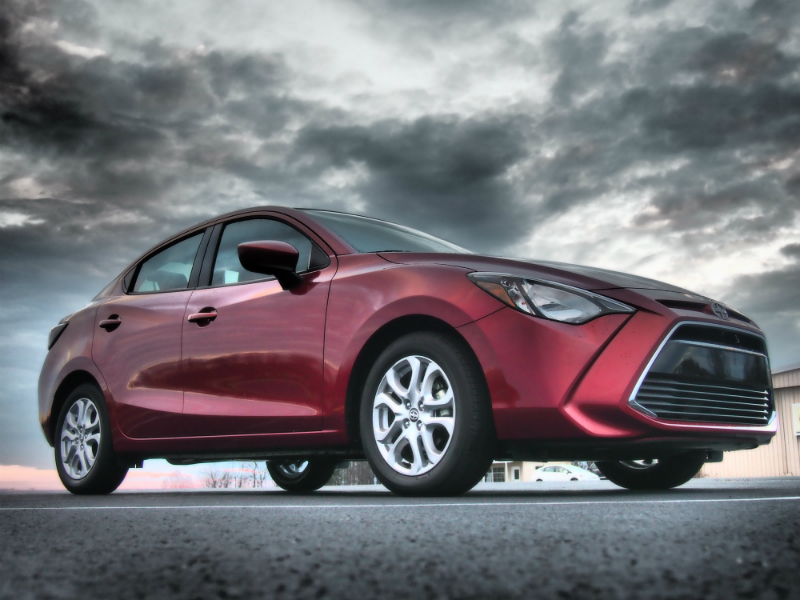 Other than the Nissan Versa Note, other entries in the subcompact class that I’ve had the opportunity to review in the last couple years came from Scion’s mothership, Toyota. 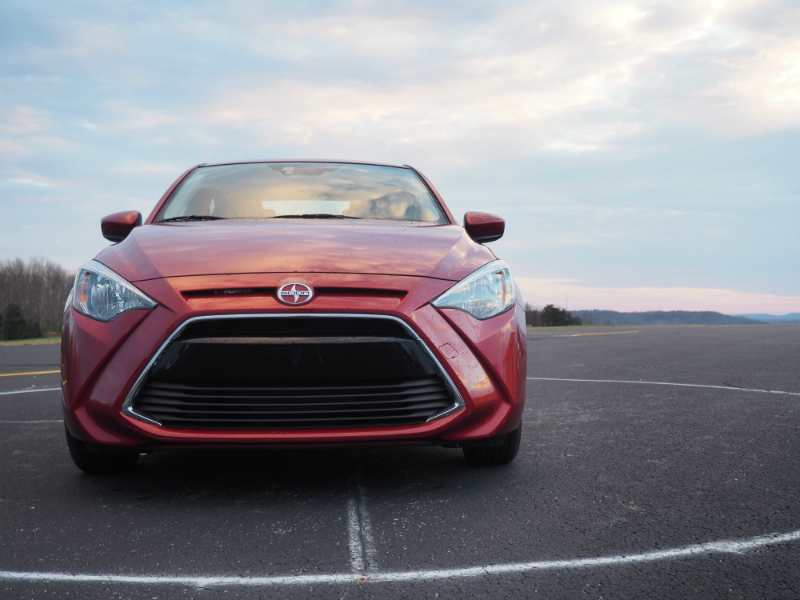 The Toyota Yaris, while recently redesigned, can’t hold a candle to the Scion iA, owing especially to its inefficient four-speed autobox and its relative rarity. Neither can its hybrid cousin, the Toyota Prius C, which trades the ability to reach 50 MPG in the real world for engaging chassis dynamics. 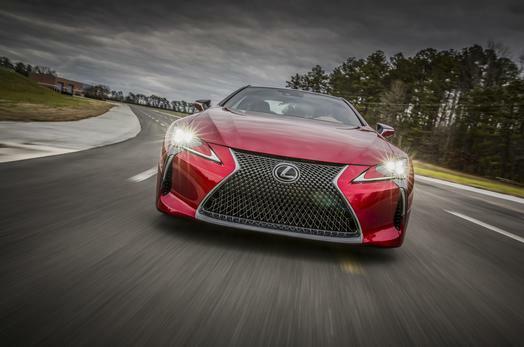 Is that bad news for Toyota corporate? Nah. This presents a huge opportunity: Toyota should ask Mazda to build a hatchback version of the iA and sell it as the new-and-improved Yaris — after all, there’s a hatchback version of the Mazda2 that, like its sedan counterpart, is not being sold in our country. After making it into the new Yaris, Toyota should take that excellent Mazda2 hatchback chassis and stick some Hybrid Synergy Drive goodies under the bodywork to make a new-and-improved Prius C.
I’ve heard rumor the suits at Toyota might be thinking about at least bringing the hatchback Mazda2 over and rebadging it as the next-gen Yaris, but nothing I’ve seen has speculated on the chassis also becomig the basis for a new Prius C. Toyota should do it, on both counts. Bottom line: If you value fun-to-drive factor over interior space, the Scion iA represents one of the most solid values the subcompact class has seen in 20 years. Solid value, no options B.S., and an honest 40 MPG. 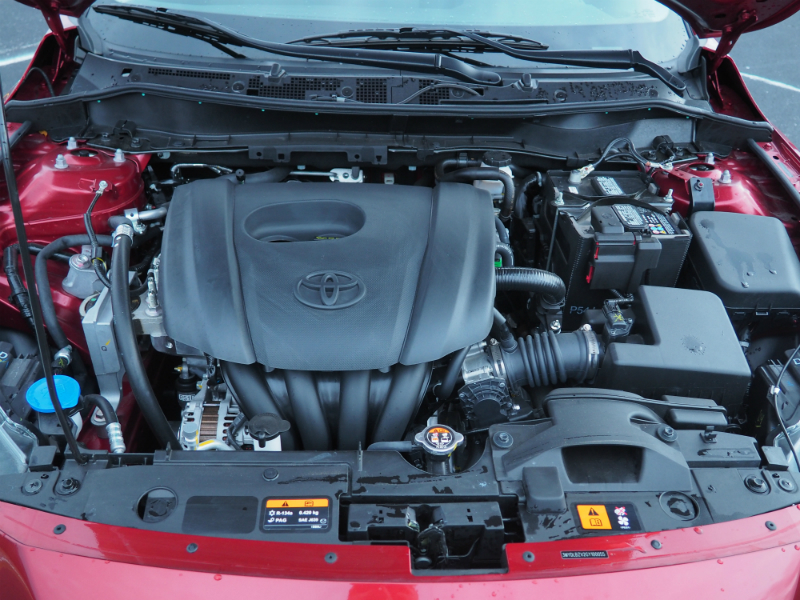 Disclosure: Scion provided the vehicle, insurance, and a tank of gas for this review.